I found this game on accident. Really, most things work out that way, right? 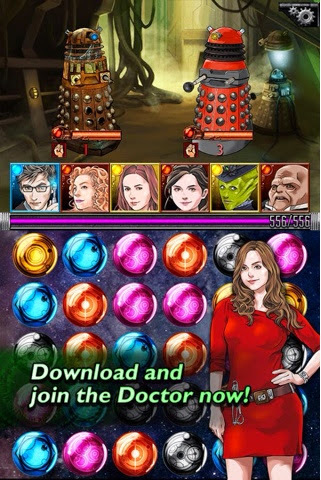 But I found it while looking for a different Doctor Who game in the App Store. It was free, so I figured what the heck. Now before this game, I was kinda addicted to Candy Crush. And I HATE that game. The company is horrible IMO and I didn't want anything to do with it, but the game was simple/challenging and I needed a mind-clearing game before bed. So I started up Doctor Who Legacy and was surprised to find it's a gem matching game. Like Candy Crush, but so much better and more complex. The game works like this - you have a bunch of colored gems, and you match them in a row of three or more. Even better, you have a team of Doctor Who characters that you put together, that dictate what attack type (by color and strength) you do. That means I can have my favorite character of all time - Stormmaggedon!!!! - and other favorites - like Elizabeth X and Clara - damaging up while Rory heals. Sounds fun, right? Hopefully, cuz I'm horrible at explaining it. The art is the real shine of this game. The characters are beautiful in their own right, and the backgrounds look fantastic. Aside from the occasional confusing background (Rorybot in New York? ), the cleverness and thought process into the details is fantastic. Gameplay is repetitive, which is to be expected, but it's still fun. I find myself playing this outside of my "bedtime" because I enjoy it so much. Plus the different characters and abilities make the game exciting and challenging in an enjoyable way. Bottom line: it's free. Seriously. You should try it out. And when you love it, drop a few bucks and buy some crystals in the game. It helps you out AND unlocks the fan area, which lets you get some characters first and easier. Plus it supports the game, which it is well deserving of.